Call before you get here if you're looking to buy moving boxes. 2nd time that they haven't had everything in stock. Always friendly service. The team always goes above and beyond the call, and always friendly service. Very handy location, and great rates. Our company has been using Storage King in Richmond for the past 3 years as a pickup/drop off point for stock/credit/returns. We also use a storage shed for any excess stock, and we have been extremely happy with all the provided facilities. But the service has been the icing on the cake. I don't think I have ever heard a "No" from any of the staff, from borrowing stationery, using their printer/fax etc. Always friendly and helpful. Thanks! Everything that I expected plus friendly service from the site manager. Storage compartment was clean, trolley/cart available for moving things around and good access. Would use again. Have just finished using Storage King (Richmond Vic) for the about the fourth time in ten years. I keep going back to them because the quality of the infrastructure and helpfulness and efficiency of the staff is faultless. Thanks Kate! Great service and good value. With over 400 units and more than 40 different sizes to choose from in this heritage building, the staff at Storage King Richmond can provide the size that you require in no time at all. 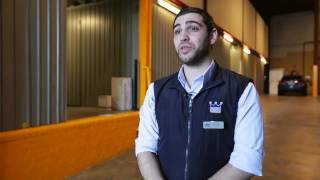 From your first contact you will experience professional service that you would expect from Australia's largest Self Storage group. Our aim is to provide "SIMPLE STORAGE SOLUTIONS" which means that we can offer advice not only in relation to self storage, but can also supply you with packing materials and advice on how to pack your items. We can recommend and arrange transportation of your belongings if required. Storage King Richmond proudly services Cremorne, Burnley, East Melbourne, Melbourne City, South Yarra, Hawthorn and Toorak.